The Making of the "Horse Bike"
The "horse bike" arose of a tequila induced stumble across the playa at Burning Man '97. My friend Wes and I had just completed a month and a half long trip around vancouver island by boat, and got to burning man a bit empty handed. We had a goofy dream of creating an igloo ( Yes of ICE!!! ) and having a bunch of blinking lights inside. But while we finally threw together a few few lights, the ice was still hundreds of miles away and we essentially brought nothing to the show. We felt a bit guilty, but we were having a great time anyway. Another friend was cruising around the play with a christmas light powered butterfly. It was mesmerizing. I'm not sure if it was wes or I that thought up the idea for an animated horse, but I think it was Wes. Back home in Shallow Alto, the buzz of burning man died away, and I became immersed in my cyclical sillycon valley lifestyle. Soon June rolled around, not wanting to be caught empty handed again, I started collecting the necessary ingredients to make the dream come true. I tried to convince my art maven housemate Kent to draw some animated sequences of a horse running but he steered me in the direction of Muybrige's images. A few minutes of web surfing brought me to my starting point. The orginal horse images are from a book called "The Horse in Motion" by Eadward Muybridge. This particular set of images were of a horse named "Sallie Gardner" and owned by Leland Stanford. The photographs were orginally taken in June 19th, 1878 by a series of still cameras placed 27 inches apart along a horse track and triggered via trip wires as the horse passed. I broke this animation up into a sequence of frames, and then processed these with Photoshop to be a sequence of simple outline images. I also increased the size of the individual frames, and cut out a few of the images since I knew that my final animation need to have only 8 images ( you computer geeks will start salivating ). The next step meant rendering this image in a physical form. I printed these 8 images out on an overhead transparency, Additionally I resized an image of the target bicycle ( taken with a digital camera and modified to black and white ) to fit with the horse images. I projected the image onto a wall where I had hung a large piece of paper. I then traced all 8 images ( each with a different color ) and the bike onto the paper. The next step took by far the longest amount of time, and involved bending braising together close to 200 feet of welding rod, one out line for each image. 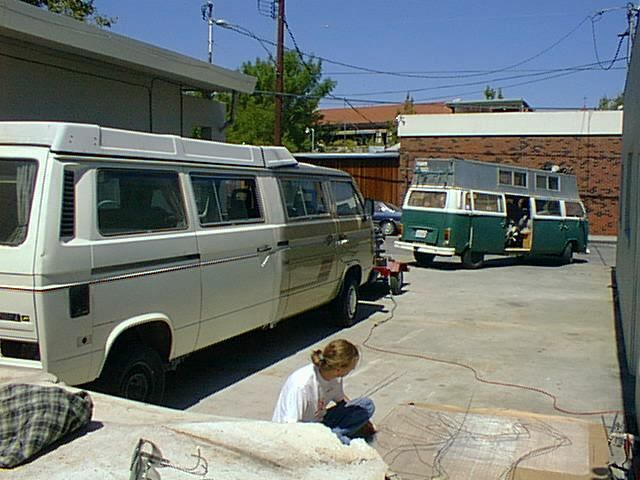 Here's an image of me working; the two streched VW busses are owned by friends. This outline was then mounted on the side of the bike using hose clamps. Where the front wheel is, I cut these outlines to allow the front wheel to turn. The seat of the bicycle was just above the rump of the horse. Once the frame was mounted to me bike, I took the liberty of coating everything with black spray paint. Once I had the 8 loops of glowy wire, the final step was hooking up the sequencing system. I was not alone in my bman '98 endevours. As in turns out, greg was already fast at work on a small PIC based board which would sequence various eletrolumenescent (sp ?? ) wire combos. ( these controllers were used in a variety of devices, which together we called "Fruit of the Lumen" ) I used a magnetic switch to ensure that the wheel speed would drive the sequence speed. As almost all burning man projects are, mine wasn't done until AFTER I arrived at bman. The first time I rode the bike around, I knew I had a successful thing. Even my friends who had seen me build the thing, and knew all the gory details were taken in by the magic. Out on the playa it drew cheers. I was most definitely overwhelmed, it was way more successful that I had ever imagined. Although the image quality is quite low, this sequence captures bman night well. Lots of people cheering on each other in crazy stunts, A huge laser shining literally from miles away. Fires scattered around. Drum circles, smoke, etc. I'm planning a few additions for the horse bike this year... stay tuned! I really love burning man, and I've been thinking about why for several years now. I think there are two key elements 1) NO commerce. 2) no reality. This second one is odd, let me explain. EVerything we bring to burning man exists because bman doesn't not stand alone. The food we eat, the materials we use, and the stuff we burn comes from some other culture. The week or so that we're at burning man is devoid of the day to day toils we all endure to provide for these things. So burning man is not reality. But it's quite refreshing nonetheless. Perhaps because it points a more appropriate direction for society to take, once we've reached a threshold of "sufficiency." In a standard capitalist world, it's more more more, but the ends, which used to have a means ( attaining sufficiency ) became rudderless when that threshold was acheived. Burning can provide a new direction to take human energies.